Boss Training is a licenced provider of UKATA Asbestos Awareness Training, the industry standard health and safety course for all those working in trades that could potentially come into contact with asbestos. Who needs Asbestos Awareness Training? If you or your employees have any possibility of coming into contact with asbestos then, as their employer, you have a legal requirement to provide asbestos awareness training in order to comply with the Control of Asbestos Regulations 2012 – CAR 12. The purpose of this asbestos course is to make workers aware of the potential dangers and the procedures they must follow if they are working with (or could be working in proximity to) asbestos containing materials (ACMs), as it presents a high risk to health and is linked to cancerous mesothelioma, among other conditions, causing around 4,000 deaths a year. When can I do the Asbestos Course? Boss Training offers UKATA registered Asbestos Awareness Training nationwide. We run our courses monthly at selected training centres or we can deliver them onsite across the UK for groups of up to 6 delegates. However, if you need training to be completed sooner, or if you need training as an individual rather than as a group, our Online Asbestos Awareness Course might be a better and more cost-effective option. Contact us today to find out when our next scheduled course takes place or to arrange an onsite training session for your team. What Does Asbestos Awareness Training Teach You? The UKATA Asbestos Awareness Training programme looks at the properties of asbestos, its effects on health, and the types, uses, and likely occurrences of asbestos and asbestos containing materials in buildings and equipment. It also looks into risk prevention and emergency procedures should asbestos fibres be released into the workplace in an uncontrolled manner. 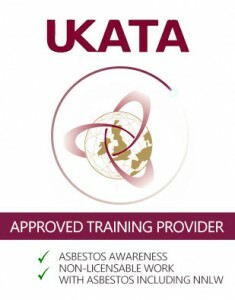 On completion of the training, successful candidates will receive the UKATA registered Asbestos Awareness Training certificate, which is valid for 1 year. After this expires, a refresher course is recommended. With the rise of asbestos-related diseases, it is more important than ever to make sure you and your members of staff are aware of the dangers surrounding asbestos. Contact us today by filling our quick contact form out, sending us an email at enquiries@bosstraining.co.uk or calling us on 01422 358 184 to book your training course or discuss your businesses requirements for a bespoke training programme. We booked our first course with BOSS Training in June 2006 and we have used them consistently ever since.